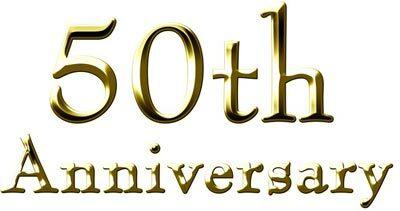 In today's modern world, reaching the milestone of 50 years of marriage is rare and is a feat that should be celebrated. Whether it is your friends, family members or even you yourself who has weathered the trials and tribulations of a half century of marriage, you should make sure that the event does not pass by without appropriate recognition and commemoration. It can be hard to find a suitable gift to demonstrate your heartfelt sentiments at this key time in your loved ones' lives. Many shop-bought gifts are dull and generic, but when you shop with The Eternity Rose, you have come to the right place to find a meaningful and truly special present that is sure to touch the hearts of the recipients. 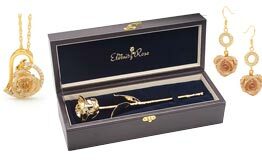 Rather than giving the happy couple an uninspiring and unoriginal token such as a golden number 50 or a gold pen, you could be surprising your loved ones with a beautiful gold-dipped natural rose, a perfectly fitting and impressive gift for the golden wedding occasion. 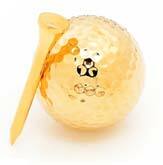 It is easy to see why a gold-dipped Eternity Rose is such an ideal present to mark the golden wedding anniversary. There are few symbols of romance and love that are more famous than the single rose blossom, so when this iconic bloom is dipped in fine 24 karat gold and presented on the occasion of the golden wedding anniversary, it holds a deep significance. 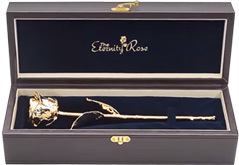 Every luxurious rose comes presented within a stylish leather display case, so it is ready to be exhibited in a special place in the happy couple's home to showcase its magnificence for a lifetime. 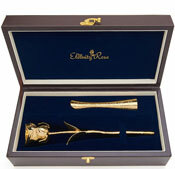 It is even possible to personalise this unique gift with a bespoke engraved message on the stem such as "My love for you grows with each passing day". The recipient is sure to appreciate the caring thoughts put into choosing such a meaningful gift. The tradition of marking the occasion of milestone wedding anniversaries with gifts seems to stem back to the medieval period and the Holy Roman Empire, in which husbands would present to their wife a golden garland on the occasion of their 50th wedding anniversary. Official lists were later created in the 20th century, assigning themes to various anniversary years, and over time these have been altered, adapted and added to. For example, the diamond was linked to 75 years of marriage however, following Queen Victoria's diamond jubilee which celebrated 60 years on the throne of England, the 60th weddinganniversary became linked with diamonds also. American National Retail Jeweler Association reconstructed the initial list, assigning every year to 25 its very own gift, and every five years thereafter. Although a half century of marriage is certainly a cause for great celebration, the tastes and wishes of the happy couple must be borne in mind. Some people relish the opportunity to hold an enormous party while others prefer to spend the day with just the closest family members. 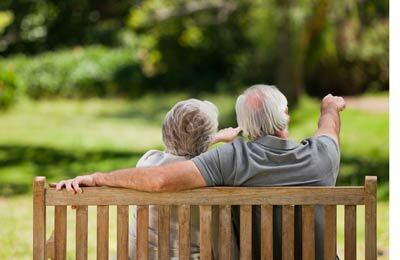 Choosing a gift can also be difficult as most couples who have been together for 50 years already have a home that is fully equipped with all the essentials of married life. A luxurious gift is traditional, however it can be hard to know what to choose as high-street stores and the internet are full of different options. Gold is the traditional material linked with a marriage of 50 years as it represents the enduring and beautiful nature of a long-lived marriage. 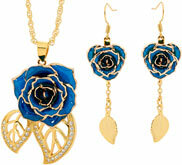 There are also some other themes linked with this anniversary year including Golden Topaz and yellow roses, all of which would be appropriate gift choices. There are many different kinds of golden wedding gifts that you can give, however a handmade gift has a particular and special appeal. Here are some good ideas. Make a CD of music that is significant to the couple - perhaps tunes from the period in which they got married, or songs that hold a particular meaning such as the first dance at their wedding. Write a poem in honour of the special couple and put it in a beautiful frame. Design a family quilt with every family member decorating their own individual square with embroidery or fabric pens. Create a wish tree by spraying a branch in gold and attach objects of significance to the couple, as well as some small gift items (eg, gift certificates or theatre tickets). Make a memory scrapbook, compiling stories and pictures of happy events throughout the couple's long marriage. Click here to find more exciting ideas for handmade anniversary presents. Part of your gift to your loved ones could be a special party or get together for friends and family members, but be careful when drawing up the guest list to include those people who the couple really want to share their special day with. The decoration theme is simple as you can easily obtain party decorations and accessories in gold for the room and tables. You could also decorate the room with photographs of the couple throughout their married life, and play music from the time in which they got married. One of the top ideas for celebrating your loved ones' golden wedding is to book them an amazing holiday that will give them more years of memories. There are bound to be places where the happy couple have always longed to go, and this could be the perfect opportunity to send them on the cruise or safari they have always been dreaming of. Although many celebrity couples' marriages end in early divorce, there are some who have successfully made it to the magic 50 year milestone. Kirk Douglas and his wife Anna Buydens celebrated their golden wedding in 2004. The Queen and Prince Philip have been married for almost 70 years and will hopefully last many more. Bill Cosby and his wife Camille celebrated their 51st wedding anniversary last year and have raised 5 children. Show your loved ones just how special they are by surprising them with the wonderful gift of a gold-dipped Eternity Rose and demonstrate to them just how much they are appreciated. The Eternity Rose would like to wish everyone who is celebrating their golden wedding anniversary a wonderful day, and here's to many more years of happy marriage.